The object of Blast Arena Advance is to control the square within the Arena and collect as many yellow, jittering flanges as possible, while avoiding the shrapnel thrown out by the explosions. Groups of three orbs appear in the Arena, spinning towards a central point. When they meet, they explode, throwing out eight glowing shrapnels. Touching one of the shrapnels is an instant Game Over. Over time, these orbs appear faster and faster. There are two hiscore tables in Blast Arena Advance, Best Scores and Best Times. Try to collect as many flanges as possible, and survive for the longest time. You can see how you've placed on the Game Over screen. Your score is saved when the Game Over screen appears. You can alter the speed of the square by holding the A or B buttons. Although this may improve your accuracy for beginners, advanced players recommend using the default speed. When the game is over, use the B button to retry and Start to exit. Use the D-Pad to navigate the menu, use the A button to choose. To turn the sound, music or ingame background oscilloscope on or off, use the A, Left or Right buttons on the Sound, Music or Scope options. one for Best Scores, and one for Best Times. Use the Left, Right, L, R or Select buttons to switch between them. Press B to exit the hiscore screen. Hiscores attributed to your current name will be highlighted in gold. Use the D-Pad to move the cursor. The A button selects a letter or option, the B button deletes the current letter under the cursor. L and R move the cursor from letter to letter. Select resets the name back to what it was when you entered the Enter Name screen. Pressing Start or choosing DONE accepts the currently entered name. Choose between the three character sets using the LOWER, UPPER, SHIFT and SYMBOL options. SHIFT switches the character set to UPPER for a single letter, then returns to LOWER. Use the D-Pad to change the snake's direction. Hold A to speed up, B quits. Try to collect as many as you can! The square glides smoothly over the Arena, use this to your advantage. The first flange appears after the second explosion. The next flange appears as soon as you collect the current flange. Keep your eyes open. If you see a flange and a gathering explosion near a wall, try to ricochet the square off the walls of the Arena to get away from the explosion. It's a lot easier to glide through the flange at great speed from a distance than try to grab it up close. Although the orbs appear faster late in a game, they always take the same time to explode. The explosions always fire eight shrapnels up, down, left, right and into the diagonals. Use the B and A buttons sparingly. Have FUN! There's no point playing if you're totally freaked out and wired. You'll have a lot more fun if you play when you're in a good mood. If you type in a secret code, new hiscores are no longer saved. Don't worry about wrecking the hiscore tables! Blast Arena Advance, a game by Mathew Carr. Based on BLAST ARENA: Game and concept by Edward Biddulph. Additional artwork by Jonathon Carr. Apex Audio System provided by Apex Designs (www.apex-designs.net). Music by Olof 'Blaizer' Gustaffson, Mark 'The Dark Knight' Knight and Risto 'Rib' Vuori. Made with the undisputably excellent devkitPro. Blast Arena Advance © Mathew Carr 2005-2006. Blast Arena © Edward Biddulph 1998-2006. All trademarks are the property of their respective owners. Blast Arena Advance is not licensed or endorsed by Nintendo of Europe, Nintendo Co. Ltd or any of their associates or subsidiaries. All program code, concept and assets have been developed without the use of any official documentation, software, hardware or any other information protected by Non Disclosure or other Agreements. 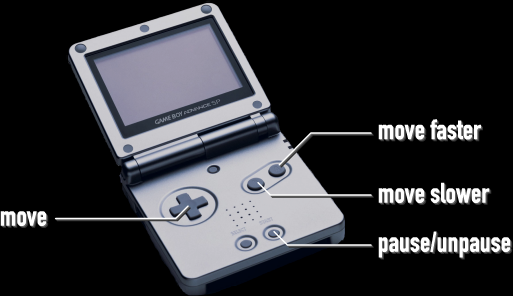 Nintendo, Game Boy, Game Boy Advance and Nintendo DS are trademarks of Nintendo Co. Ltd. This project and these cartridges are 110% unofficial. All rights reserved. All trademarks are the property of their respective owners. You know, for kids!